Taking care of ourselves, powering up our physical strength, and even surrendering to relaxation are all acts of boldness in today's hectic world. If you are looking to recharge and refocus on your unique inner strength, what better place to do it than among goats? All farm classes are donation based, do not require a reservation and are open to all people. Please arrive 10-15 minutes early to settle in and pull all the way behind barn to park. Some classes are WITH the goats wandering amidst us as we practice, some are beside the goat pasture and we will visit with them after an hour of movement. The amazing Gretchen Campos will be coming back to lead some of our farm yoga sessions this summer! I am beyond excited! You can catch her: Sat. June 15th, Thursday June 20th, Saturday July 13th, Thursday July 18th & Saturday July 27th! If you know her, you already love her. If you have never taken one of her classes at Greener Postures, I can assure you you are in for a treat! Stay tuned for a couple other special guests in August and September! HOPE TO SEE YOU for DONATION ALL-LEVELS yoga in the field! Thursdays 5:30-6:30PM June, July & August. And Saturdays 9:30-10:30AM. Do yoga right next to the goat pasture then get to know them after class. All classes are donation, all level classes and end with goat snuggles. Note there are way more babies in June (50ish!) and usually only a few kids left by August. No need to register ahead, just come on by. If you can pull all the way in behind the barn, that will help us keep parked cars off the road. And... since the self serve fridge is open Fri-Sun, people who attend yoga get early dibs on all the weekends treats! Hope to see you all back again this summer and to meet many new folks as well! As a high school English teaching veteran (27 years), Nigerian Dwarf Goat Farmer and Dairy Owner (9 years) and yoga teacher, Hope Hall believes her passion for all these jobs is rooted in her desire to see connections instead of barriers. Hope completed her 200 hour yoga teacher training program in 2017 with Sacred Seeds and now leads yoga at the farm where sometimes up to 80 people gather in the field to downward dog with goats and try goat cheese and snuggle babies after practice. Her classroom, farm, and yoga classes have allowed Hall to create small spaces where people can come together to celebrate what makes us feels most human. The farm is always looking for new ways to build a community of people who want to slow down, respect animals as much as we do and love good food! Check back often for new offerings. Sunflower Farm Offers Workshops Year Round! Our goal is to provide a break from the daily grind and a window into the most human parts of yourself. While our workshops offer diverse explorations, each experience is grounded in creativity, community and connections to nature. Of course, a visit with the goat herd is part of every gathering! Perhaps you have been so busy keeping up with life that you have not had time to honor your amazing inner self. Life moves more slowly at the farm and there is all the space you need here to take an afternoon for yourself. See page above for way more info and photos and also check out event page on Facebook for updates about Bold Goat Yoga! Come for a one hour goat yoga class in the field, followed by goat visiting and cheese tasting every Thursday night 5:15-6:15 pm and Saturday 9:30-10:30 am during June, July & August. May through December we offer periodic cheese classes for beginner cheese makers exploring Farmer's Cheese, Chèvre, Feta and Cajeta. Every class is a mixture of tasting, creating and learning. Choose some fresh ingredients from the farm's herb garden and mix up your own goat cheese to take home to share. At the end of class try your hand at goat milking. Some wine and laughter always mixed in for good measure! We try to have a class each month August-November. Click below to reserve your spot before they fill up. SATURDAY JUNE 29th 2-4 pm. Always wanted to own your own herd, but nervous about learning the details of goat care? Come to our Best Goat Class Eva’ and learn to trim hooves, milk a goat and give shots. Even get a tour of the cheese kitchen and mix up your own chevre to take home! Bringing home kids this spring and feel a little nervous? 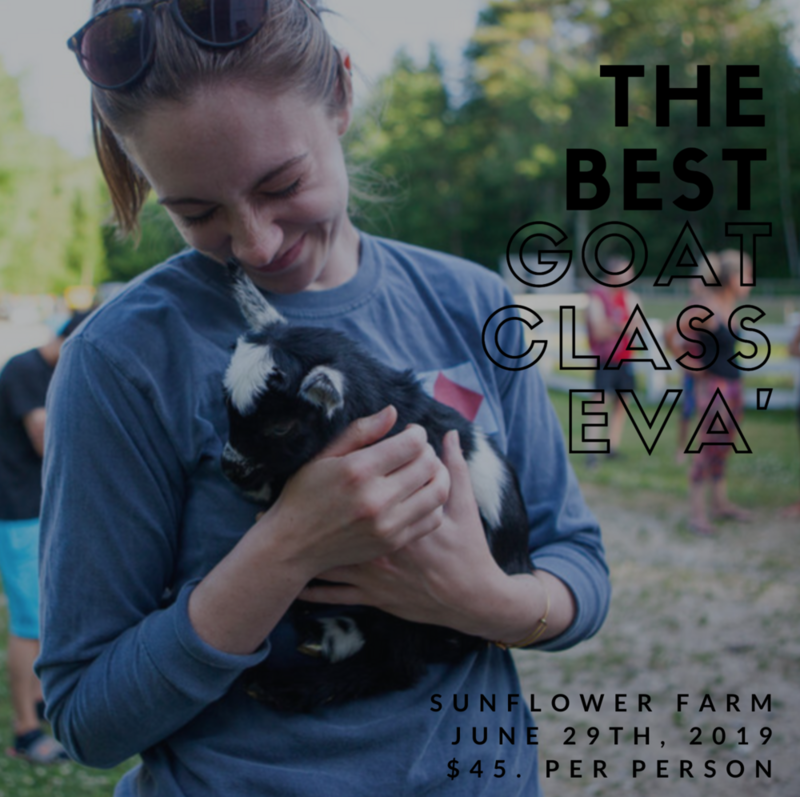 Then this class is an excellent chance to ask lots of questions and to connect with others who are getting goats for the first time. To reserve your spot before it fills up, click link below. ALL FULL- will post another soon! We welcome educational visits from groups of all sizes and all ages. We have been classroom teachers for 25 years and are enjoying the opportunity the farm provides to connect people to their food sources in meaningful ways. We can work with schools, nursing homes, daycares, tour groups and families to design an educational experience geared specifically to your needs and interests. Your Farm Visit might include: pasture time, tasting of products, games in the field, acting out a goat related story with our goat kids, time to hold goat kids, Cheese making, a goat milking demo, learning about the animals on our farm, animal care and our products. Prices depend on the size of a group, the length of the visit and what you would like to be part of your experience while at Sunflower Farm. Minimum $200. per visit. Please call or email Hope to chat about possibilities. Some groups in the past have come to do sketch work for art class, to write in journals, to have a physical experience as a break from desk work, and to learn more about small farming in Maine. Families sometimes come for a crash course on goat ownership so they can learn to clip hooves, milk a goat and ask lots of questions. If you have original ideas for your group, just let us know, we would be happy to make it happen. Prefer to let us design a visit we know your group will love? Give us the info on the group and leave the rest up to us so you can enjoy the day. Looking for a fresh way to spend a few hours? Come have a tasty and memorable afternoon learning how to make cheese with other fun adults from May-November! Check our calendar and Facebook page for upcoming classes. The cost is $60. a person for 2 hours. We will go over the process for chevre and feta, make a quick Farmer's cheese, make cajeta, and mix up some chevre of your own design for you to take home. (Cool ingredient ideas or edible decorations? Bring them along...but we'll have lots here.) You'll leave with lots of treats and the ability to make cheese at home. If you like, you can help out with evening milking (and goat snuggling) before heading home for supper. Can also do more simple class for groups looking to learn a bit about milk and cheese and who want to mix up their own chevre to bring home. This activity would be 1 hour and cost $30. per person. If you are interested in signing up for a future class click link below where you will find more info on classes in July, August and September. Looking for a reasonably priced collection of photos for a special event or just to capture the sweetness of a particular age? We are not professional photographers, but love the smiles that the farm brings to light and the fun of getting them recorded! Come for a half hour photo shoot, we'll take lots of sweet farm photos and send them to you within 24 hours. The cost is $50. and Sunflower Farm reserves the right to use photos for publicity purposes. Senior photos, family photos, kid pics, prom pictures...we are ready to get your smile just right! Don't love the pictures? We'll rip up the check.